Custom MyLifeOrganized Views on your MLO-iPhone! We are excited to announce that MyLifeOrganized for iPhone ver. 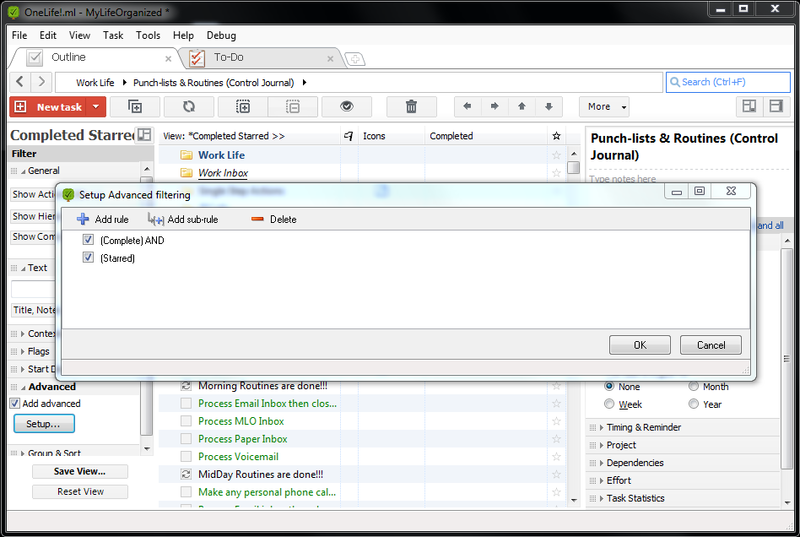 2.5.0 will contain a functionality to import Custom Views from MyLifeOrganized for Desktop. This version has been already submitted to Apple and we are waiting for the release very soon after their approval. The new functionality will allow you to use your MLO-Desktop Custom Views on MLO-iPhone after the import. 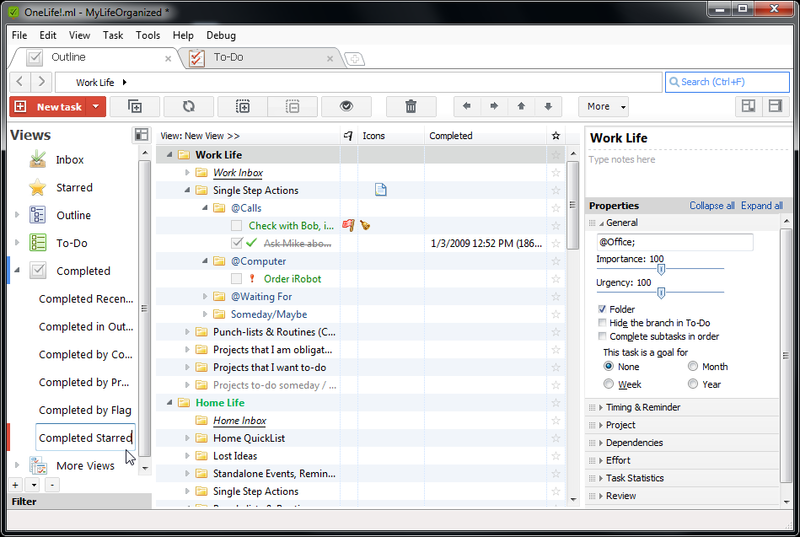 You will be able to see your task lists filtered, grouped and sorted the same way you see them on your Desktop now. The importing of any views from your desktop to iPhone is very easy. Let's do it together step by step. 1. In MLO-Desktop right click the views tree, select "New view..." and enter a name for the new view. Let's create a view of completed tasks which are also starred. 2. Open Advanced filter for the new view and add conditions for Complete and Starred. 3. Add other parameters to your new view like sorting and grouping. 4. Click Save View... to save all the changes before exporting. 5. Right click new view and select Export view(s)... from the menu. Enter a name for the file. 6. Now you need to transfer this file with new view to your MLO-iPhone. The easiest way is to send it via email which could be opened on your iPhone. 8. MLO-iPhone will parse the import file to find all views you have in it. Note: the views will be imported to the current MLO-iPhone profile only. To import the same view for other profile - open this profile in MLO-iPhone first. 9. After you complete the import the new View will be added to the Imported Views group on your iPhone. 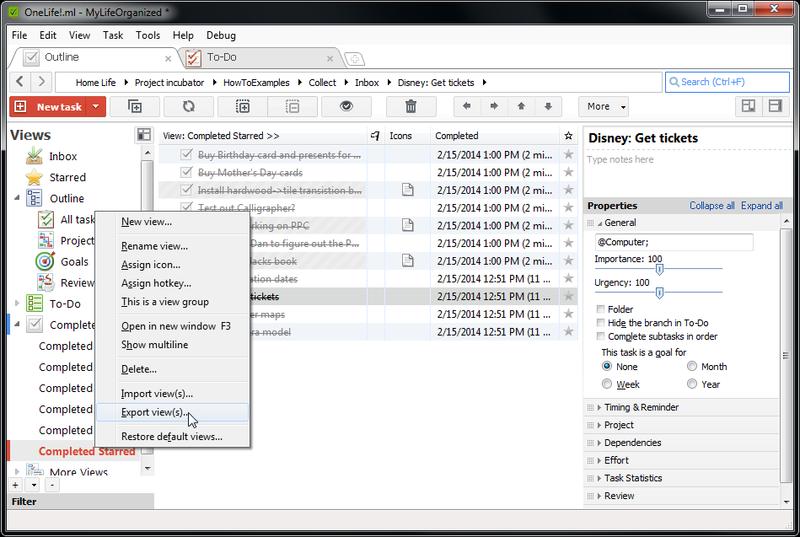 Now you can use this view to see the same task list as you do on desktop. 10. You can click Edit and rearrange imported views to other groups as well as rename, hide and delete unused views. 1) Only one level of grouping can be used on MLO-iPhone. If import a view with several level of grouping which desktop supports only the first level will be used on iPhone and the rest is ignored. 2) Manual ordering is only supported in predefined Starred and Active Starred views. MLO-iPhone cannot keep in sync the manual ordering for other custom views. 3) You cannot change the custom view settings on iPhone now. If you want to change your view - change it on destkop and import to iPhone with the same view name. I know that our team did a great job implementing this sophisticated and revolutionary functionality for iPhone. I hope you will like it! We also plan to add it to the Android platform as well. "Only one level of grouping can be used on MLO-iPhone. If import a view with several level of grouping which desktop supports only the first level will be used on iPhone and the rest is ignored"
does that mean it will not work when that feature become available on Android? I hope not because the mobile app will remain useless for me then. 2nd question: why does one need to manually export/import the custom views? I assume you will make this more userfriendly in the future? Well, that's great. But when will similar functionality be coming for Android? Or at least, ability to sync custom views. The Android app is very limited in usefulness and seems lagging behind the iPhone app quite a lot. I was just looking at possibly upgrading my MLO PC from 3.6.3 to v4, but I don't see the point of adding a whole bunch more ways to organize views, if I then cannot sync them to my Android phone and tablet! Nice development. Chomping at the bit for the Android version -- can't wait! Great feature! Works pretty well on new MLO HD (2.0 for iPad) with one minor exception: the to-do list ordering options set on the desktop don't seem to apply to the view when imported on the iPhone/iPad. Specifically, I like to dial down the "start date" and "due date" criteria to near-zero on the desktop before saving/exporting my views to iPad. So the "importance" and "urgency" fields drive the scoring for my todo-list views; this usually works great on desktop**. But on the iPad, using the imported view, the importance/urgency appear to have no effect on ordering. Start and due dates however, impact list ordering quite a bit.